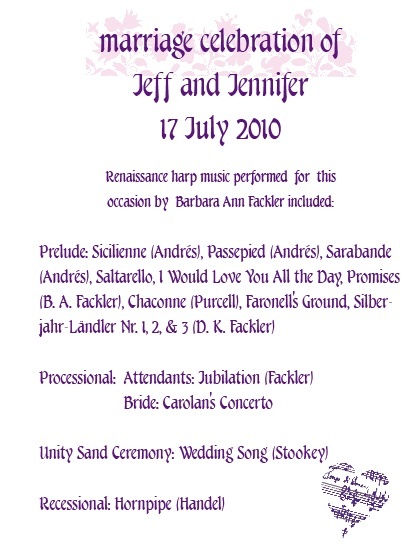 Choosing music for wedding ceremonies is a very personal process. 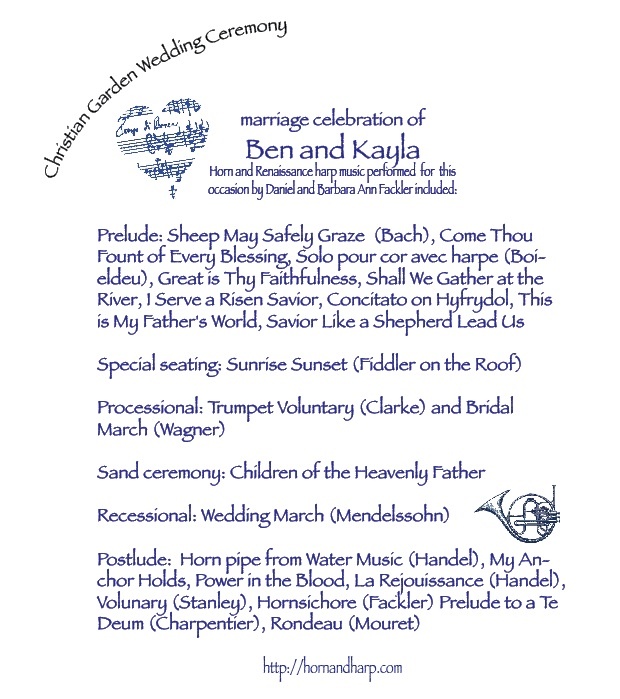 The sample wedding ceremonies below will give you an idea of what other couples harp music have chosen for their ceremonies. 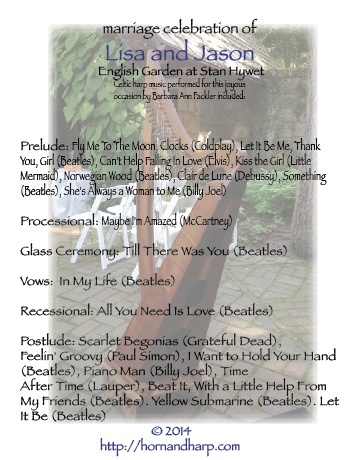 You may include harp solo as the only music for your wedding celebration or may add other instruments such as horn or violin. Some churches limit music choices, so before you start choosing music, check with your clergy about any restrictions that may be in place. More often than not, the restrictions are few. 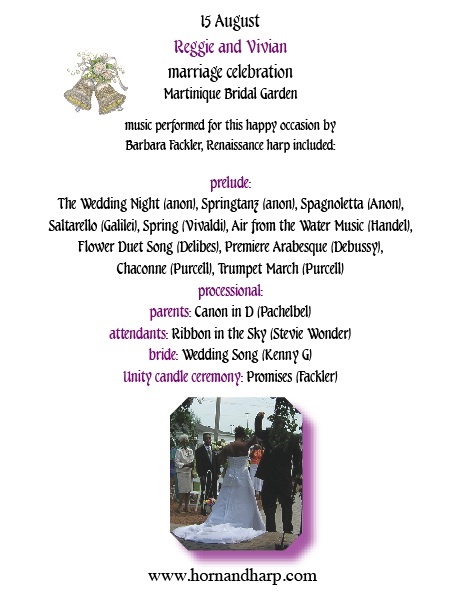 Some couples choose all classical harp music so that the ceremony is a more formal part of the celebration than the reception. Others include music from their heritages and you'll see in the samples included here how music becomes a symbol of the combining of their cultures. Others prefer popular music that is meaningful to them. You don't have to include a march as your wedding processional if you'd prefer to walk down the aisle to your favorite song. There are many old standards used in wedding ceremonies and they're used a lot because they work so well. 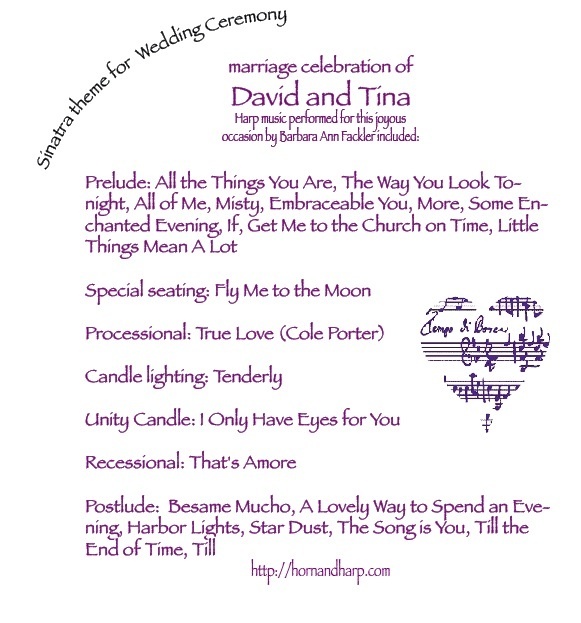 As you choose your ceremony music, think first about what you'd like to hear, not what is usually used. 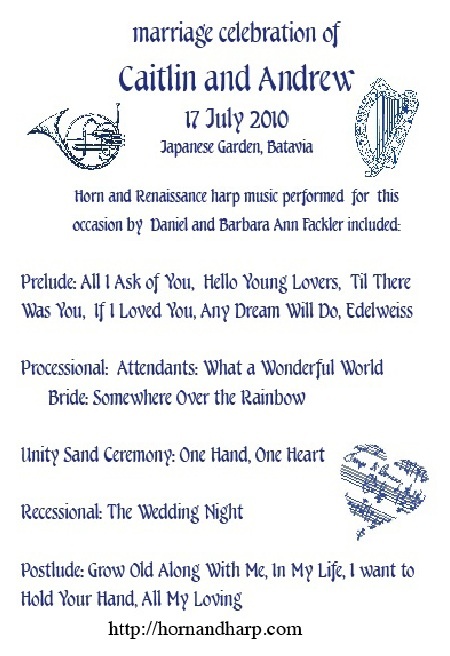 That way the harp music you choose for your wedding ceremony will be unique as it reflects you as a couple. If you are planning an outdoor wedding you might find our list of outdoor wedding hints helpful as well. 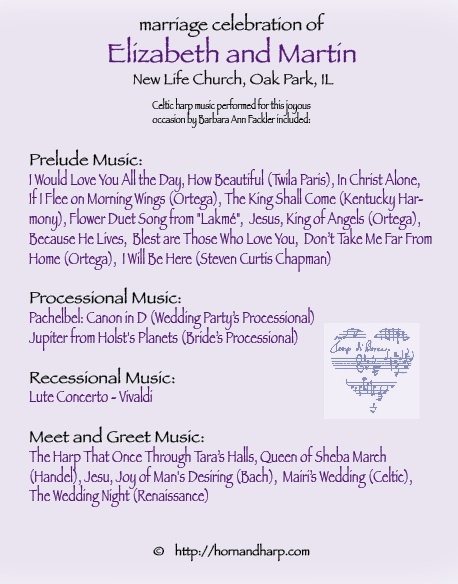 The following mp3 files (some harp, some midi) may be helpful in choosing your ceremony music. Each opens and plays in a new window so you can mix and match and see how things fit together. 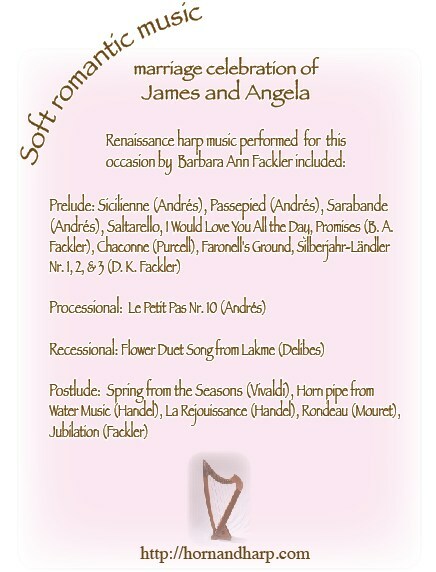 Flower Duet Song from "Lakmé"
Please contact me for a copy of a complete repertoire list for the harp I'll be using for your wedding. Outdoor wedding tip #1: SHADE You invited people you love to your wedding: love them and don't make them sit in full sun for a long time. Outdoor wedding tip #2: SHOES Wear flat/low heeled shoes. Small, high heels sink into grass which can ruin shoes. Change for the reception. Outdoor wedding tip #3: LISTEN Assess natural noise levels at ceremony site, traffic, fountains, etc. Amplify if needed so guests can hear. Outdoor wedding tip #4: COMFORT Provide bottled water for guests if it's hot. Keep guests hydrated&comfortable; as they celebrate with you. Outdoor wedding tip #5 LOCATION Choose a location allowing easy access for guests not be able to navigate a long walk on uneven grass. Outdoor wedding tip #6: WIND Hire a florist who knows how to secure flowers so they can't blow over&be ruined. Plan ahead & prevent a mess. Outdoor wedding tip #7: WIND/CANDLES Even with a glass chimney, a slight breeze will extinguish a candle. Consider a sand or wine ceremony instead. Outdoor wedding tip #8: AISLE RUNNER Find some way to secure the aisle runner to the ground or use rose petals instead. Outdoor wedding tip #9: PARASOL OR FLOWERS? Replace your bride's maids flowers with beautiful parasols for a unique effect. Outdoor wedding tip #10: MUSIC Live music is easier to coordinate than recorded music. 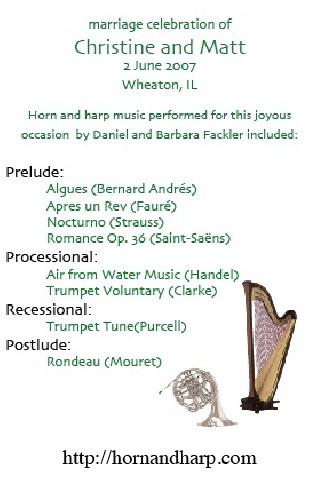 Choose instruments that aren't affected by humidity.